New Delhi: Regulatory failure has led to a surge in sales of unapproved herbicide tolerant (HT) genetically modified (GM) cotton seed packets in the ongoing Kharif planting season, putting thousands of farmers at risk across states such as Maharashtra, Telangana, Andhra Pradesh and Gujarat. The regulatory failure has been precipitated by the fact that the genetic engineering approval committee (GEAC) of the environment ministry, the agency tasked to decide on commercialization of GM crops, is awaiting the final report of an expert committee set up by the Prime Minister’s Office (PMO) in October last year. 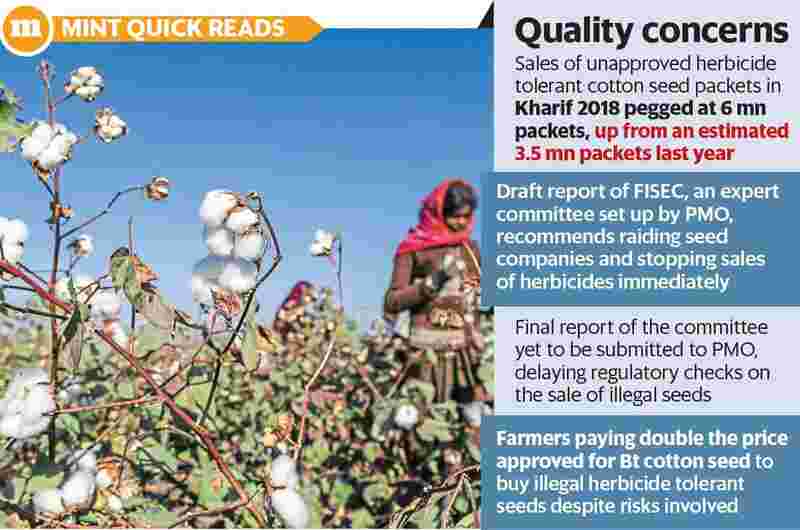 The panel has suggested stringent measures to check the menace by “raiding premises of companies hoarding illegal seeds" and “destroying all HT cotton seeds confiscated by state authorities before Kharif 2018", according to a draft of the recommendations of the Field Inspection and Scientific Evaluation Committee (FISEC) under the department of biotechnology, reviewed by Mint. The committee also recommended taking “measures to stop the sale and use of glyphosate (herbicide used to kill weeds in HT cotton fields) immediately" and the constitution of “an inter-ministerial committee of experts, including (those from the) ministry of health and the Indian Council of Medical Research, to review the safety of glyphosate and other herbicides". However, the committee is yet to submit its final report to the PMO, while the seed sales will be over in less than a month in the ongoing Kharif crop season.“Last year, sales of illegal HT cotton seeds were estimated at 3.5 million packets and this year it is likely to cross 6 million packets," said a senior seed industry official who asked to remain unnamed. “Most of the 46 companies producing GM cotton seeds in India are indulging in illegal seed production and sale," the person said. “Farmers evidently like this new technology so governments are unwilling to act, worried about the political fallout ahead of general elections next year," the official said. “The (unapproved) technology has spread into farmers fields like water and enough packets are available for sale in cotton growing regions of Maharashtra.... The problem is that if these seeds fail (since quality is suspect because of illegal production) farmers have no one to blame," said C.D. Mayee, president of the Delhi-based non-profit South Asia Biotechnology Centre (SABC). “Most Hyderabad-based seed companies are involved," he said. “Both FISEC and GEAC should have acted fast. It will be difficult to check the spread now," he added. Last year, following field surveys in several states, SABC had estimated sales of illegal seeds at 3.5 million packets. Around 45 million cotton seed packets are sold in India every year and are used by more than 8 million growers. “The situation is indeed sad. A decision was taken at the highest level... So we are waiting for the FISEC report," said a member of the GEAC who did not want to be named. “Most of the illegal seed is produced in Gujarat and sold to farmers in other states... There is enormous political pressure not to take action against seed companies," said a senior government official from a major cotton growing state. Farmers from Maharashtra that Mint spoke to said HT seeds are available for around ₹ 1,500 per packet and many are buying these despite the risk that they may be spurious. The hefty price farmers are paying is double the maximum sale price of ₹ 740 per packet imposed by the agriculture ministry on approved Bt cotton seeds. Farmers are taking to HT technology to save on labour costs—using these seeds they can spray herbicides like glyphosate to kill weeds without endangering the plant itself as the HT cotton plant is immune to it. The HT or Roundup Ready Flex technology developed by Monsanto was under regulatory approval stage till 2016 when the company withdrew its application from the GEAC as the centre imposed price control and fixed royalties on sales of GM cotton seeds. “This is a replay of the Bt cotton episode which was approved in 2002 under similar circumstances... Regulators are colluding actively with the violators of the law in this case," said Kavitha Kuruganti, convener of the Alliance for Sustainable and Holistic Agriculture, a policy advocacy group.